The UO Libraries’ Center for Media and Education Technologies is encouraging professors who still use VHS tapes in their classes to reach out to their subject librarian and learn more about the digitization services offered at the library. Most likely, the material they’re using already exists in the digital sphere — if it does, the librarian can help faculty locate digital copies. If it doesn’t, the media center can assist faculty in digitizing it with its digitization workstation. Digitizing is a priority for the center because VHS tapes are in their twilight years. This summer, the last known VCR maker in the world stopped production. Funai Electric in Japan, which sells under the Sanyo brand in North America, blamed sales and a parts shortage for the shutdown. But it’s not just VCRs facing the test of time: Videotapes degrade over time — more speedily if they’re kept in humidity or if mold gets to them — and copying tapes often causes them to lose quality. It’s not just that the age of the VHS tape is over; all traces of that age will eventually disappear. 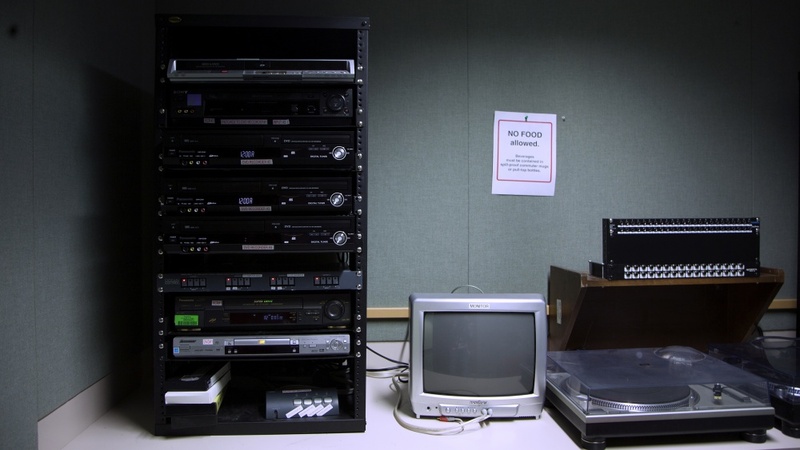 At the UO, roughly 50 VCRs still exist between the Center for Media and Education Technologies and VCRs installed in classrooms, according to Rusby. But with the last VCR maker in the world shutting down, that needs to change. Faculty who intend to use VHS tape when teaching should contact their department’s Knight Library subject specialists or the Center for Media and Education Technologies’ educational technology team in Room 19 in the Knight Library basement. The Educational Technology Support and Consulting Office is open 9 a.m.-5 p.m. and can be reached at cmetconsult@ithelp.uoregon.edu. Students seeking to digitize VHS content for educational uses can utilize tools available at the center’s equipment checkout desk. The center’s hours are Monday to Thursday from 7:30 a.m. to 6:30 p.m. and Friday from 7:30 a.m. to 5 p.m. The center can be reached by email at mediasvc@uoregon.edu.